This blog is part of a series organized by The Huffington Post and the NGO alliance InterAction to call attention to the crisis in the Sahel, a region in sub-Saharan Africa where more than 18 million people face starvation and 1.1 million children under the age of 5 are at risk of dying from acute malnutrition. Click here to read more of HuffPost Impact's coverage of the Sahel and here to find out what InterAction members and others are doing in the Sahel. 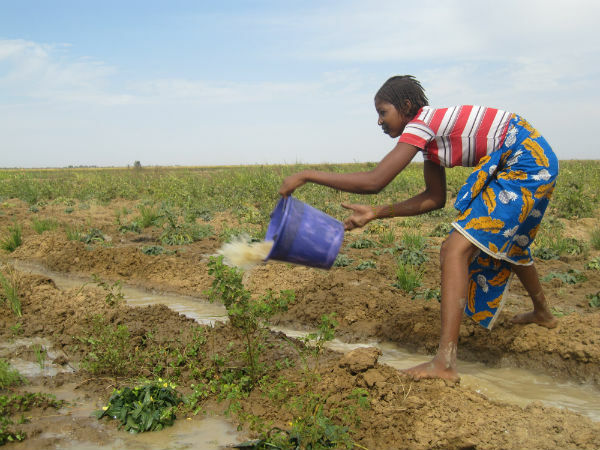 Mali is no stranger to drought. The country has long stretches of desert plains rocked by seasonal monsoon winds and dust tsunamis; temperatures easily crawl into the 100s. Hama Cisse farms here, in the country's Sahel region, alongside the northern Sahara where disaster looms. Almost 20 million people face starvation in the Sahel. Widespread drought, high food prices and poor harvests have left over a million children at risk of severe malnutrition. But, despite low rainfall and general food scarcity, Cisse has had a bumper rice yield this year. His surplus rice is no accident. Over the last three years ACDI/VOCA, an economic development organization, has helped Cisse and some 10,000 others in the northern Segou region of the Sahel make the transition from seminomadic livestock herders to sedentary farmers and landowners through the Alatona Irrigation Project, funded by the Millennium Challenge Account (MCA). For centuries the inhabitants of this region depended on natural rainfall to create viable grazing grounds. For these pastoralists, one year of low rainfall, like last year's, could wipe out herds and create an insurmountable disaster. Resettling and retraining these often-marginalized herders has helped them transition from a subsistence lifestyle into commercial agriculture. It's also brought a measure of food security to this fragile area. Working with local organizations, ACDI/VOCA helps train the former herders to grow rice with careful irrigation, soil conservation and fertility practices. The farmers are also diversifying and selectively marketing second-season cash crops. Perhaps most importantly, they are learning water management, including the maintenance of a network of canals. The project has been successful. Alatona farmers are producing 5.2 tons per hectare and making on average $1,000 per hectare in a country where average annual incomes are measured at $700 per year. This project is designed to go beyond food subsistence and move into agribusiness, where farmers can invest in small threshing machines, de-hulling machines and motorized tractors. Cisse was the biggest rice producer in the project's first campaign. He had no prior knowledge of rice cultivation or irrigation but now speaks to the project's success in building local capacity for long-lasting outcomes: "The team is teaching us about water management. I have gained knowledge in hydraulic systems, irrigation and drainage techniques. I'm also learning about best practices in terms of management of the irrigation system." "Everybody thought we herders were incapable of successfully developing the land that the project has given us," Demba Diallo, a chief of one of the resettled villages remarked. "With all the positive impacts we are seeing, we are organizing ourselves to better overcome defeats." Meanwhile, elsewhere in the Sahel the situation is alarming. If nothing is done, millions could die from hunger. "The time has come to act, and to act in a concerted manner to deal with the real and root causes of food crises in our region," Togo's Prime Minister, Gilbert Fossoun Houngbo, has said. The project is holistic. It integrates financial services, irrigation development and women's gardens into its agricultural training program. It fosters sustainability by helping producers form farmer organizations that have market advantage whether buying farm inputs or selling the crops. The agricultural land in the project is being cultivated under a land title system, which is a first for the region. Now farmers own the land and have incentives to make improvements. As decision-makers, they put in crops the market demands. Challenges still exist for the Alatona Irrigation Project, such as maintaining long-term soil fertility, sustaining the canal infrastructure and transferring know-how to younger generations. Already, political instability has halted the project early. Still, the short-term success amidst the unfavorable conditions bodes well. David Benafel, ACDI/VOCA's chief of party in Mali observed, "Mali's greatest resource is her people, who are proud and resilient despite visible environmental and social challenges." ACDI/VOCA is a private, nonprofit organization that promotes broad-based economic growth, higher living standards and vibrant communities in low-income countries. For more information visit ACDI/VOCA's website, follow us on Twitter or like us on Facebook.